"It sounded like gun shots," said Angelique Schornstein. 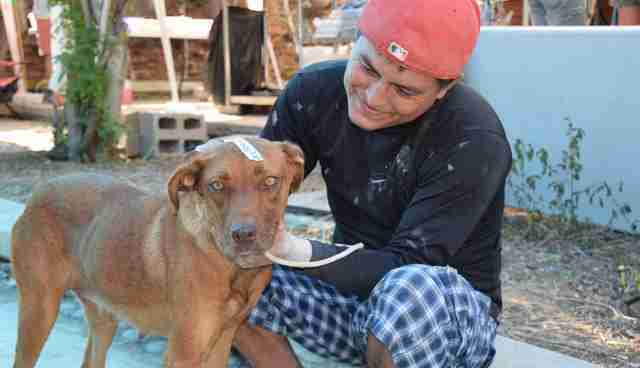 She had no idea what was going on until the next day, when she walked the streets of her new neighborhood in Todos Santos, Baja, Mexico, only to find dead dog after dead dog on the side of the road. When Schornstein moved from the U.S. to a town that had little regard for strays in 1990, she quickly learned that shooting dogs dead was the method of animal control. This was her new home, and she knew she had to do something. "I was horrified," she told The Dodo. Dogs roamed the streets in packs. They were mangy and underfed. The military would go around twice a year to kill them as a means of population control. According to Schornstein, "because of poverty, lack of knowledge and just not caring," that is what was done. "I never saw any dog leashed unless it was a little foo-foo dog." The mass killings prompted her to start her first spay/neuter clinic in 1994. 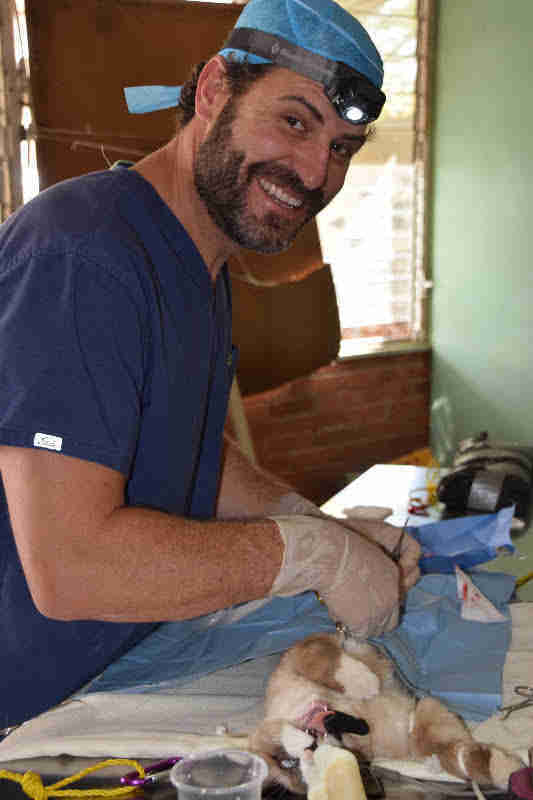 Schornstein, now president of the rescue group The Amigos de los Animales de Todos Santos (AATS), personally went out and rounded up 16 cats to start. A veterinarian friend from the U.S. spayed and neutered the animals in Schornstein's boyfriend's home on the kitchen countertop. "I asked him if he had like-minded vets from the States, and he said, 'Yes.'" That started the free clinic, from then on and every year afterward. AATS works to improve the lives of the dogs and cats in the Todos Santos area - and has brought the end to the shooting of dogs for population control. The most recent clinic was held November 19 to 21, at the local cultural center, a far cry from the kitchen countertop where it originated. 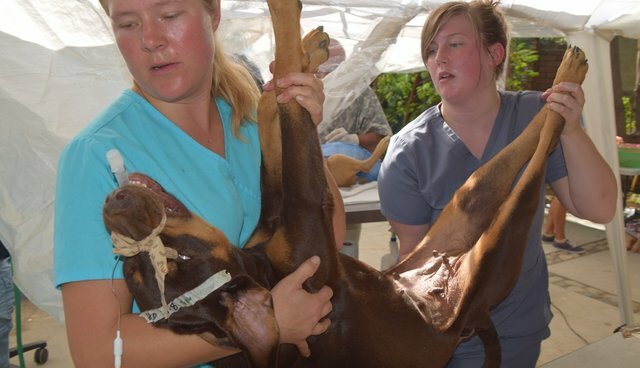 Although it was held once a year for the first 10 years, the clinic is now held in November and March, with hundreds of dogs and cats spayed and neutered at each event. Schornstein said most surprising to her this time was the number of young men who came in with their male dogs, and many were pit bulls. "I was totally floored," she said, as it can be very difficult to relay the message that male dogs do not lose their manliness when neutered. "I go around town, and when I see anybody with a dog on a leash, I comment and compliment them on the beauty of the dog and ask if the dog is fixed. I tell them about STDs and how the dog will be much healthier when neutered," she said, adding that her efforts are getting through to people. 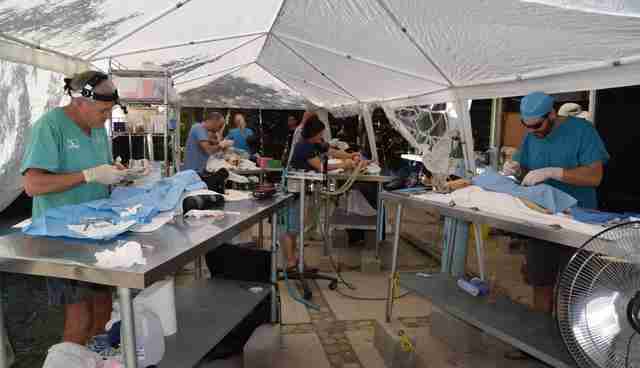 At the latest clinic the crew worked long, hard hours, especially on Saturday, the last day. The total spay/neuter numbers were: 82 female dogs, 37 male dogs, 16 female cats and 16 male cats for a total of 151. Among the vets donating services were Lee Pearson, DVM, and Francois Gauthier, DVM, both of New Hampshire, and John Kuck, DVM, who flew in from Colorado where he owns his own veterinary hospital in Basalt. Dr. Kuck has been to these clinics multiple times and said there is typically a core group of vets who fly down to donate their services. They pay their way to fly to Mexico, where they are offered a place to stay along with meals. "We do have local vets that come and help including Dr. Rafael Franzoni, from La Paz," Kuck said. Fliers are posted and someone drives around with a loudspeaker to announce the free clinic, which is first come, first served. "We can accommodate maybe 60 animals a day depending on the number of doctors we have," Kuck said. The community has done a 180 as it has been more and more accepting of the practice of sterilizing pets, according to Kuck. "It's easier to bring a pet into the family when they are not pregnant every six months," he said, adding that dogs are healthier when they are spayed and neutered. "I've noticed a big difference since coming down. I don't see as many dogs on the streets." The animals who come in are in less than perfect health, according to Kuck, who also said there are a lot of infectious diseases in the area. Not only are owners appreciative, but "it's nice to see these dogs who come from tough circumstances go home and lead great lives," he said, adding that he has brought two dogs from the area home to the U.S. The situation is a bit more under control these days, however, "it's still needed every time we do it," Schornstein said. "I can definitely tell you that the health of animals coming into clinics now is 100 percent better than it was even 10 years ago. They are usually well fed." Across the world, spay/neuter saves lives and helps curb the potential for generations of unwanted pets. When a female dog is not spayed, the number of puppies born to her and those offspring is staggering. According to Kuck, those numbers are potentially in the hundreds of thousands. "A pit bull could have 10 or 12 per litter and start at 8 months of age," he said. "She could get pregnant every six months for every year she lives. Then her offspring would start having babies," and so on. With regard to the survival rate of puppies in Baja, he said that most dogs won't achieve adulthood. "By just preventing them from being conceived, we are preventing a lot of suffering." AATS runs solely on donations. Learn more about how to help here. And read more about what you can do to prevent pet overpopulation here.